Ahead of a third US-sponsored resolution at the UN Human Rights Council over Sri Lanka’s alleged failure to properly investigate alleged war crimes during the civil war against minority Tamil rebels, which ended in 2009, the Chinese government on Saturday said considerable progress has been made in the country following the end of the war in Sri Lanka. Chinese Ambassador to Sri Lanka, Wu Jianghao, speaking at the opening of the second phase of a China-funded highway, said that “notable development can be seen in the entire country”. Wu said that over the past two years the island nation has developed rapidly. 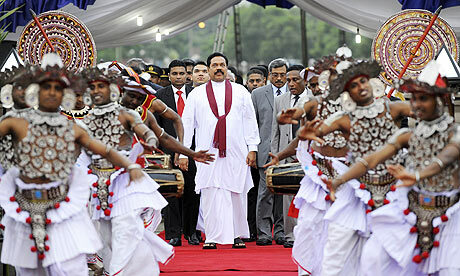 “People used to ask me if Sri Lanka is a country which is not progressing. I tell them Sri Lanka is progressing at a rapid pace,” said Wu. The Chinese ambassador said that infrastructure development, including the new southern highway will help further boost the economy and tourism in Sri Lanka. China’s fellow BRICS member South Africa had said last week that Sri Lankans should be allowed to find an internal resolution to allegations of war atrocities. “We should all strive to support all Sri Lankans on their journey to find a sustainable and permanent solution,” Maite Nkoana-Mashabane, South Africa’s Minister of International Relations and Cooperation told the 25th Session of the UNHRC earlier this month. Sri Lanka’s government is considering a process similar to South Africa’s post-apartheid Truth and Reconciliation Commission to heal the wounds of its decades-long civil war. The Sri Lankan Foreign Ministry had sent two senior ministers who led a team to South Africa in February for discussions with the country’s government and the ruling African National Congress. The next UNHRC resolution on Sri Lanka is to be put to vote in two weeks time in Geneva. Neighbour and BRICS member India, which has a major Tamil population, had backed the previous two resolutions but is unclear if it would abstain from the vote this time. A deal between Sri Lanka and India saw Indian peace- keeping troops being deployed to the north of the country to disarm the rebels. Sri Lanka’s Tamil Tiger rebels had decided to avenge former Indian Prime Minister Rajiv Gandhi’s decision to send Indian peacekeepers to intervene in the country’s civil war in the 1980s. Gandhi was assassinated by an ethnic Tamil female suicide bomber during a campaign rally in 1991 in India.